Recent headliner Comet C/2011 W3 Lovejoy cruises above a pre-dawn sky in Tasmania on Dec. 2011. Death-defying comet Lovejoy speeds its way above a Tasmanian pre-dawn sky in this spectacular photo shot by a Pakistani skywatcher. Dr. M. Akbar Hussain, an astrophotographer with the Pakistan Amateur Astronomers Society/Karachi Astronomers Society, snapped the recent comet C/2011 W3 Lovejoy on Dec. 27, 2011. 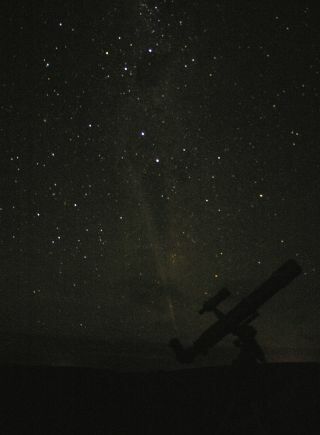 “The view was breathtaking …we attempted to photograph the comet early morning today (27/12/11) before dawn. It was quite hazy with layers of clouds and the comet is fast getting dimmer. The ion and dust trails were easily separable though,” Hussain wrote on the Pakistan Amateur Astronomers Society Website. Discovered on Nov. 27, 2011 by Terry Lovejoy of Queensland, comet Lovejoy was in the spotlight throughout Dec. 2011 as it passed about 87,000 miles (140,000 km) above the sun. The comet survived passing so close to the sun’s atmosphere, but astronomers believe it may have lost a significant portion of its mass. Since its brush with the sun, the comet was seen over the Southern Hemisphere before it faded from view.